Private Shove (standing) with unidentified member of 1st Mass. Heavy Artillery. Shove died of wounds received before Petersburg in June 1864. This letter was written by Pvt. Charles Henry Frye (1840-1906) of Co. D, 14th Massachusetts Infantry. This regiment was reorganized as the 1st Massachusetts Heavy Artillery in January 1862. They served in several military garrisons around Washington, including forts Woodbury, Tillinghast, Craig, Albany, and DeKalb. On 26 August 1862, the regiment was sent to the front, and was present at the Second Battle of Bull Run, though it did not participate. During the Union retreat from the battlefield, Confederate cavalry overtook the 1st Massachusetts, capturing the surgical staff, the wagoners, and others. The doctors were quickly released, while the others were later paroled. 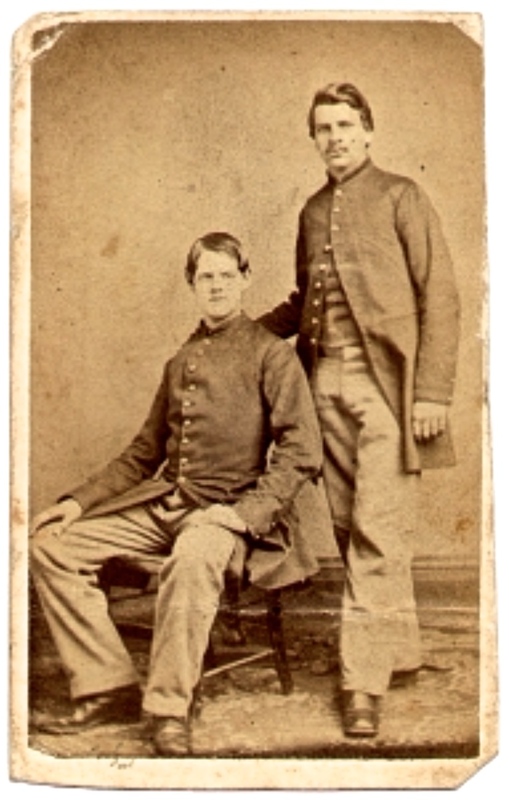 A battalion of two companies were detached (two more joined a month or two later) on 27 September 1862 and sent to Maryland Heights, where they were to serve until December 1863. When the Union army abandoned its position at Winchester, VA in June 1863, Company I stayed behind to destroy the guns and ammunition, and 44 men were captured on 10 June. At this time, Company H was covering the army’s retreat from Harpers Ferry. On 17 May 1864, many heavy artillery regiments filled in as infantry units and joined the Army of the Potomac as part of Grant’s 1864 campaign. In their first real engagement as a regiment, they engaged Ewell’s Division at Harris Farm, on the Fredericksburg Road near Spotsylvania, VA on 19 May 1864. In this battle, they lost 55 killed, 312 wounded, and 27 missing. In reserve during the Battle of North Anna on 23–26 May 1864, losing only 1 killed, they moved on to Cold Harbor, losing two members during the trench warfare there from 4–12 June. The regiment took part in the assault on Petersburg on the 16 June 1864, and lost 25 killed and 132 wounded. They remained as part of the siege of the city until April 1865. During this time, they were also involved in the Battle of Globe Tavern (or the 2nd Battle of Weldon Railroad), when 185 men were captured when a Confederate offensive flanked the division, and the Battle of Hatcher’s Run. Following Lee’s surrender in April 1865, the 1st Massachusetts Heavy Artillery returned to Washington, DC and stationed the forts until they were mustered out in August. They returned to Boston on the 20th, and were encamped at Gallop’s Island until the 25th, when they were paid and discharged. Charles enlisted in July 1861 and his service record indicates he remained with the regiment until they mustered out in August 1865. Charles was the son of Isaac Frye (1809-1887) and Charlotte Bertey Cook (1819-1857) of Boxford, Essex County, Massachusetts. Charles wrote the letter to Orrin N. Foster (1843-1917), the son of Nathan Foster (1798-1877) and Harriet Berry (1806-1878) of North Andover, Essex County, Massachusetts. 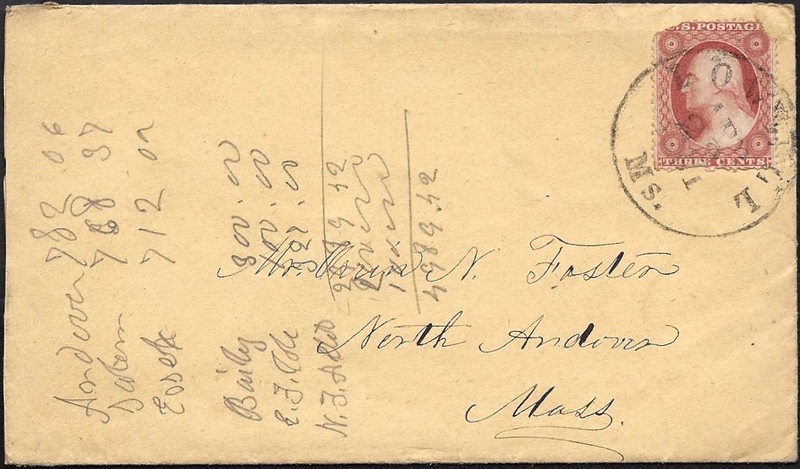 Addressed to Mr. Orrin N. Foster, North Andover, Mass. I received your letter some time ago but have neglected to answer it. I will now try and write a few lines to let you know that I am alive and well and hope these few lines will find you the same. We are still in old Virginia with no prospects of moving at present. But can’t tell as everything is kept secret by the officers. The privates know nothing of what is going on until they have orders to march. We have got a new uniform so we manage to keep comfortable. The weather is not quite so cold here as it is in Massachusetts at this time of the year. I suppose you got to school this winter in the little red school house near Wood Chuck Mountain [Woodchuck Hill]. I hope you have a good time although I suppose Hannah Moulton don’t go but perhaps Adda does. That is just as good. There is not many girls out [here] except yaller [mulatto] gals but some of them are good looking. Enough of gals, and now for something else. There was a review of seventy thousand troops last week — eighteen thousand of cavalry, fourteen batteries, and fifty thousand infantry — which was quite a sight. for the thirty thousand spectators. Our regiment was highly complimented at headquarters for their marching and manual of arms. There was people there from all around. Long Bridge was free for citizens which any other day they have to get a pass from headquarters to go over the bridge into Virginia and very few can get a pass there is so many spies. I can’t think of much to write. Tell George if you see him that I would like to hear from him soon. Twelve regiments have come over this side [of the Potomac] within a week. The Irish Sixty-Ninth [New York Infantry] which I suppose you have heard so much about came over yesterday. ¹ Thanksgiving has come and gone and I dined on Salt Junk and made a very good dinner. I must now bring my letter to a close for the want of something to write. Write as soon as convenient to your friend. ¹ Before crossing the Potomac River in early December, the 69th New York (“Irish Brigade”) had been encamped at Camp Corcoran on Meridian Hill in Washington D.C. Their new camp was (“Camp California”) was located several miles west of Alexandria between the Little River Turnpike and the Orange & Alexandria Railroad.